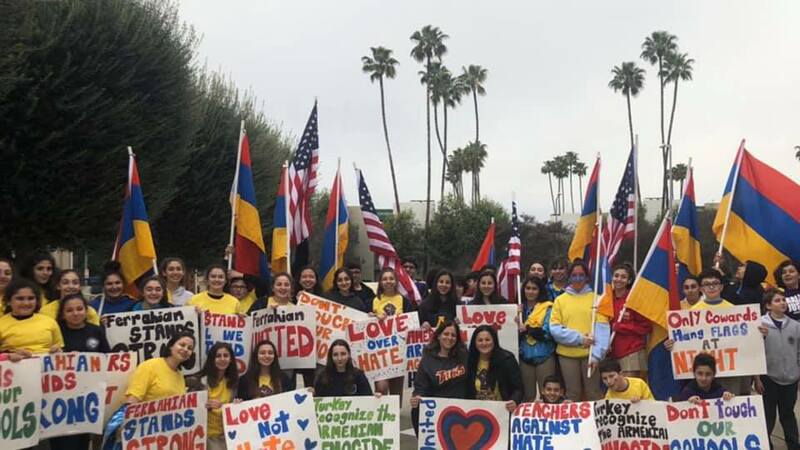 As previously reported, during the early hours of Tuesday, January 29, Holy Martyrs Ferrahian High School in Encino and AGBU Manoogian-Demirdjian School in Canoga Park were targets of a hate crime as both campuses were vandalized with Turkish flags. A local synagogue was also the target of a similar hate crime. 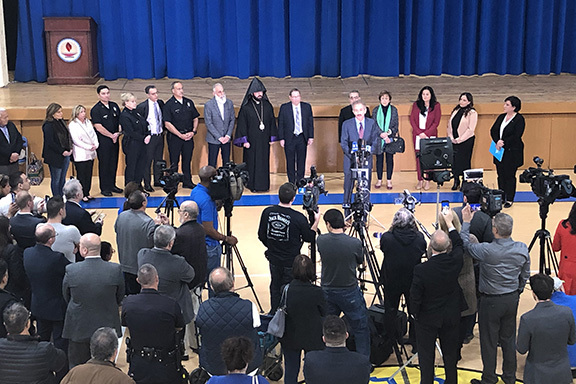 On Tuesday afternoon, the Armenian Genocide Committee held a press conference at Ferrahian School’s “Avedissian” Hall with the participation of city and law enforcement officials and more than 200 community members, school faculty, students. 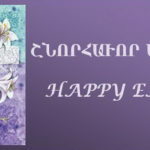 On behalf of the Prelate, Vicar General H.G. 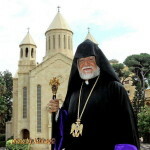 Bishop Torkom Donoyan and Archpriest Fr. Razmig Khatchadourian attended. 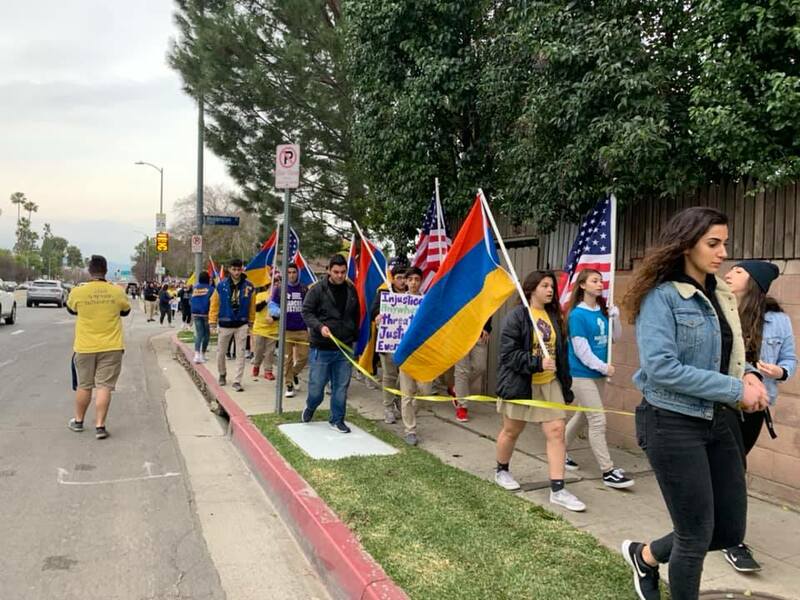 Executive Council member Rafi Kuyumjian, Board of Regents members, and representatives of community organizations were among those in attendance. 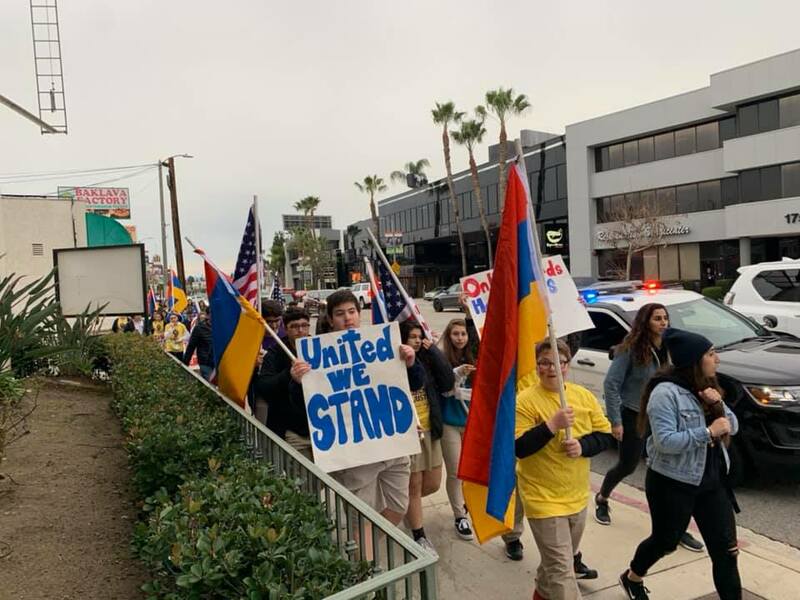 On Friday, February 1st, students of both schools gathered at Ferrahian and marched together as a symbol of unity and resilience. 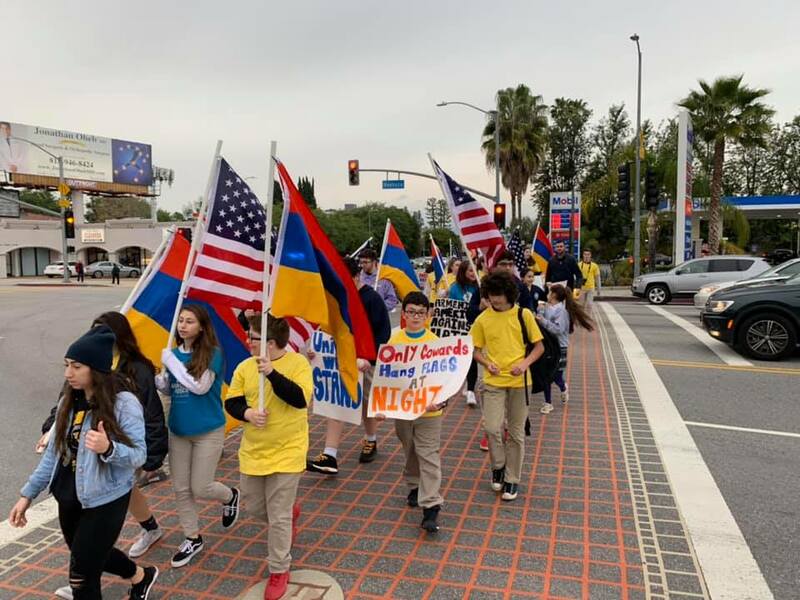 In response to both the Armenian School and synagogue incidents, on Thursday, February 7, the Interfaith Solidarity Network hosted a prayer vigil of support and solidarity at Our Lady of Grace Catholic Church in Encino. Archpriest Fr. 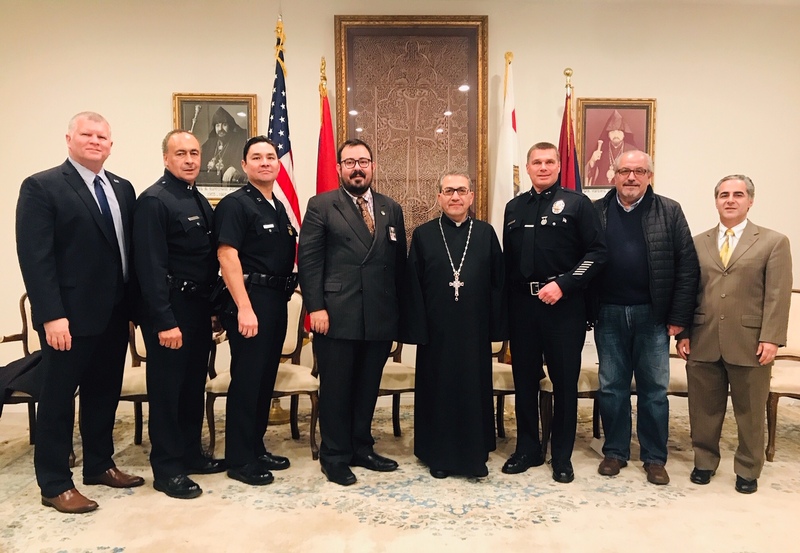 Razmig Khatchadourian attended on behalf of the Prelate, accompanied by Deacon Rafi Garabedian, and Deacon Toukhman Khatchadourian. Fr. 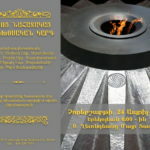 Razmig conveyed the Prelate’s greetings while Deacon Rafi delivered remarks. 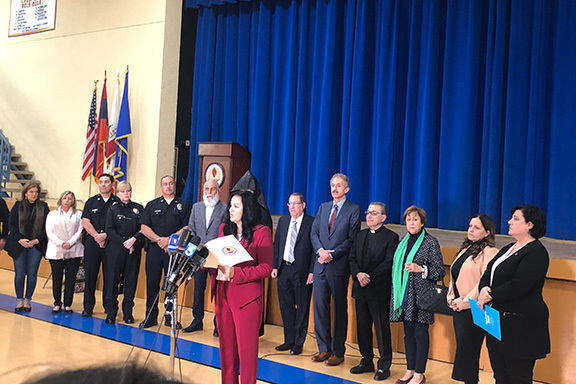 Finally, on the evening of Monday, February 4, a briefing called by the office of Los Angeles City Councilmember Paul Koretz was held at Holy Martyrs Church in Encino to update the community on the progress of the investigation. Representatives of both schools participated in the meeting, including Archpriest Fr. Razmig Khatchadourian and Holy Martyrs Church Board of Trustees members, Principals, members of the School Boards, and representatives of community organizations.